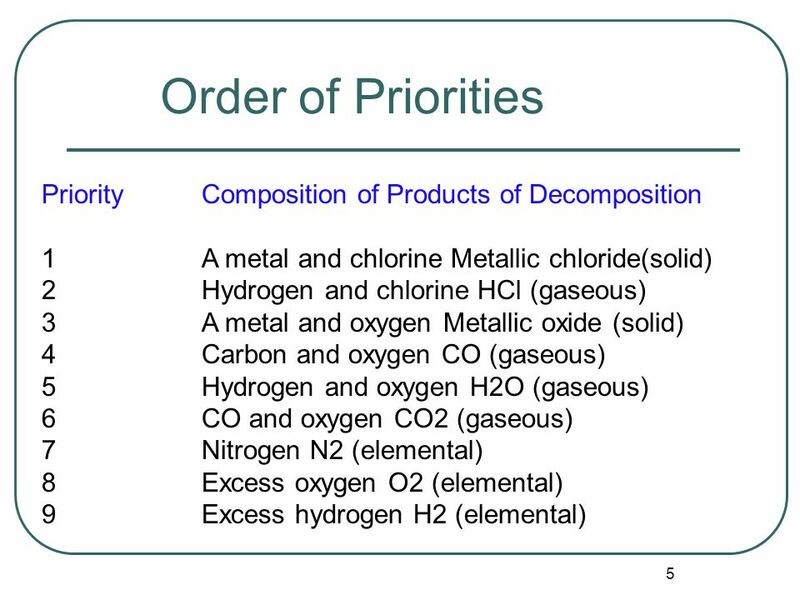 EXPLOSIVES: Taken in part from a seminar by Jim Kahoe and Greg Brown Effects of an Explosion Classification of Explosives Low Explosives High Explosives. 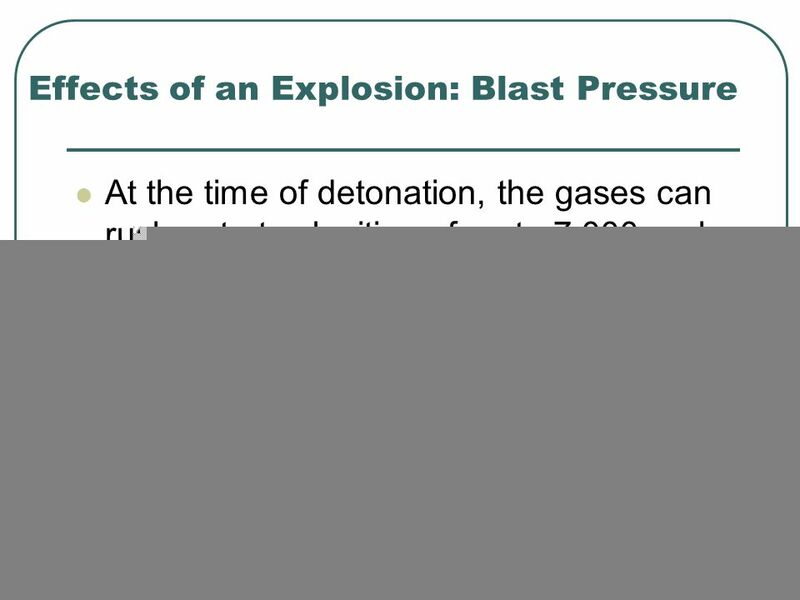 3 3 Effects of an Explosion: Blast Pressure At the time of detonation, the gases can rush out at velocities of up to 7,000 mph and can exert pressure of up to 700 tons per square inch. This gas travels in a outward circular pattern like a giant wave, smashing and shattering everything in its path. 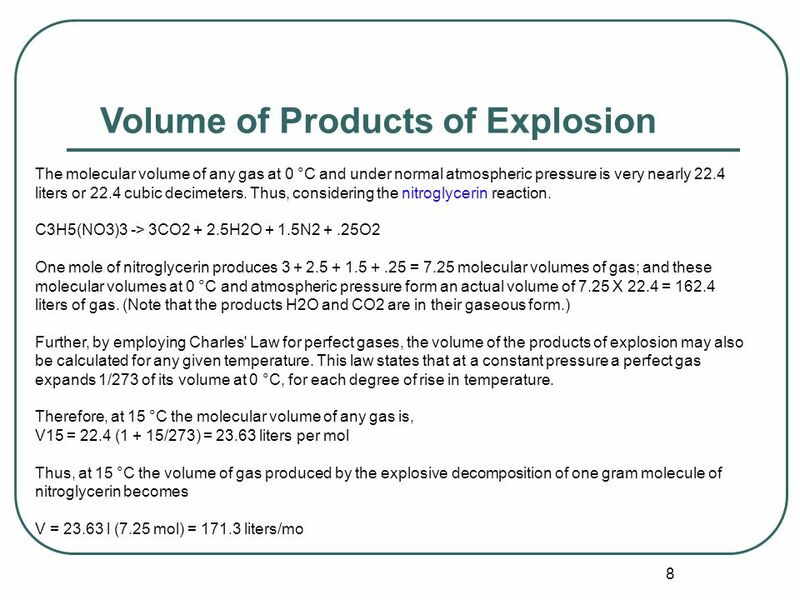 9 9 The potential of an explosive is the total work that can be performed by the gas resulting from its explosion, when expanded adiabatically from its original volume, until its pressure is reduced to atmospheric pressure and its temperature to 15 °C. 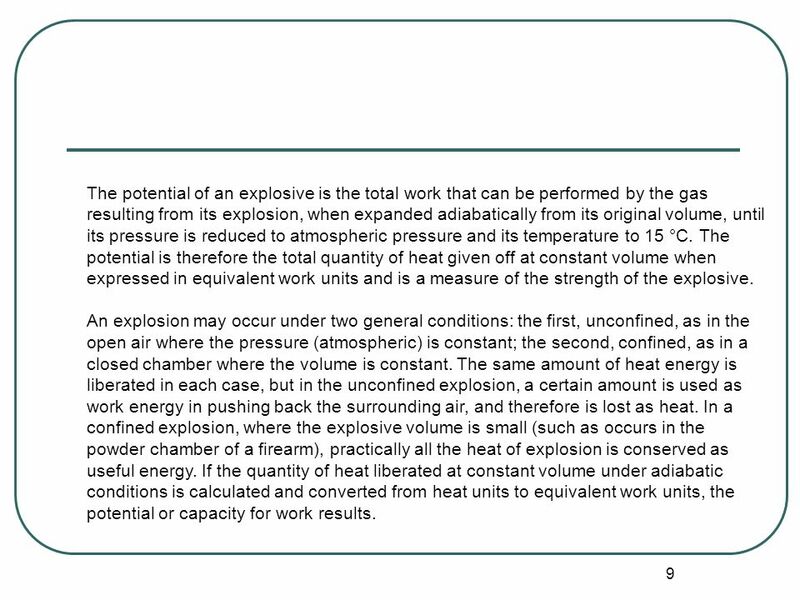 The potential is therefore the total quantity of heat given off at constant volume when expressed in equivalent work units and is a measure of the strength of the explosive. An explosion may occur under two general conditions: the first, unconfined, as in the open air where the pressure (atmospheric) is constant; the second, confined, as in a closed chamber where the volume is constant. 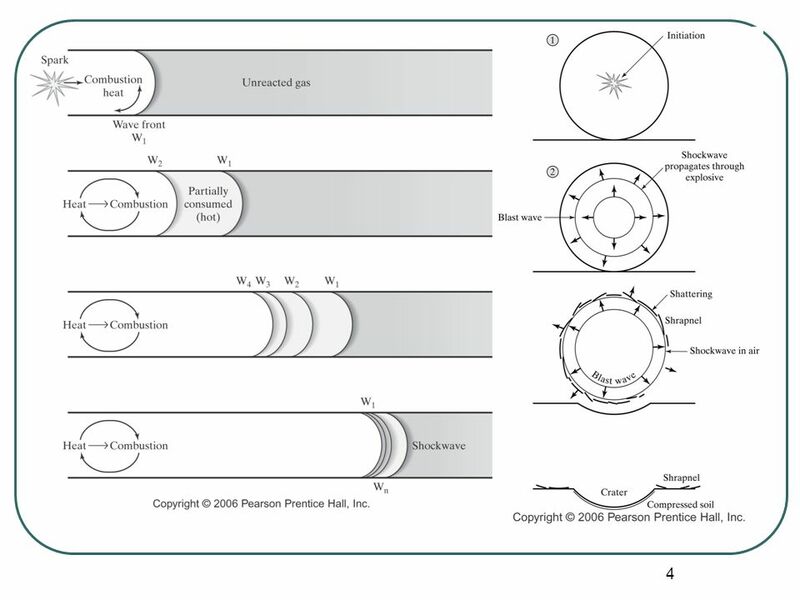 The same amount of heat energy is liberated in each case, but in the unconfined explosion, a certain amount is used as work energy in pushing back the surrounding air, and therefore is lost as heat. 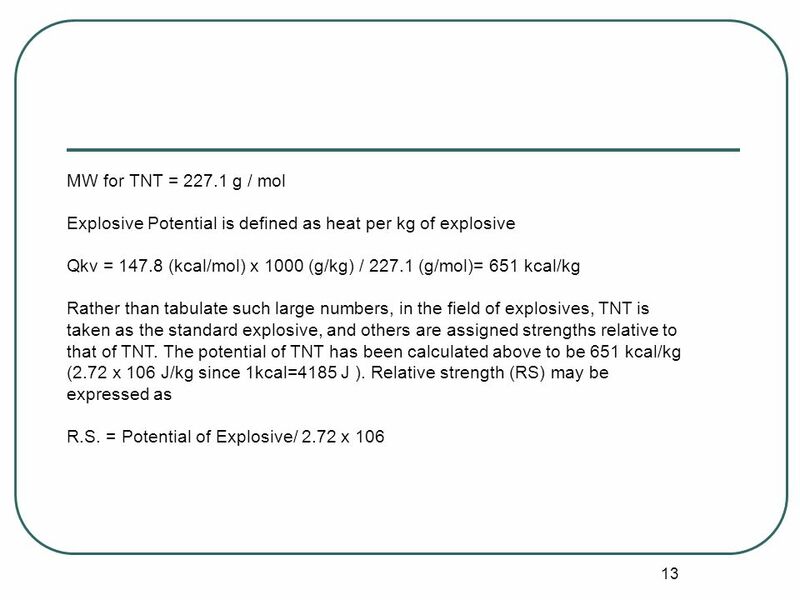 In a confined explosion, where the explosive volume is small (such as occurs in the powder chamber of a firearm), practically all the heat of explosion is conserved as useful energy. 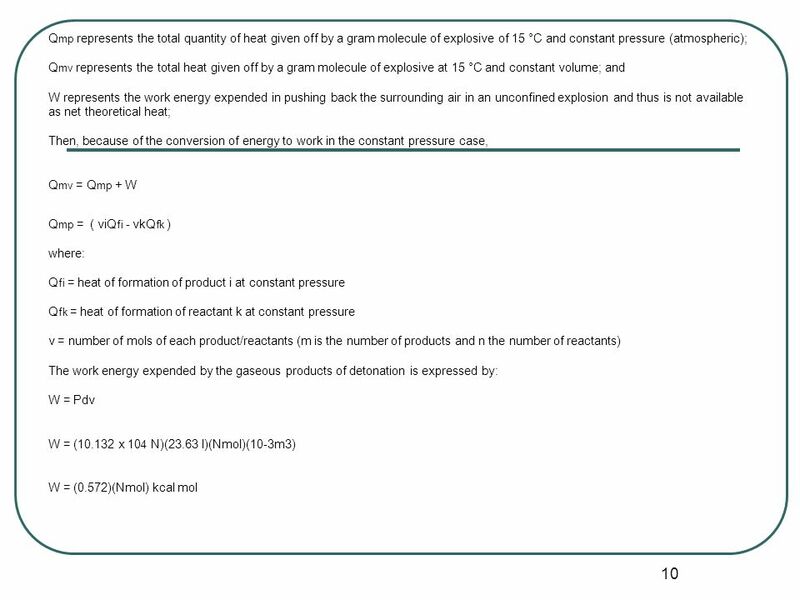 If the quantity of heat liberated at constant volume under adiabatic conditions is calculated and converted from heat units to equivalent work units, the potential or capacity for work results. 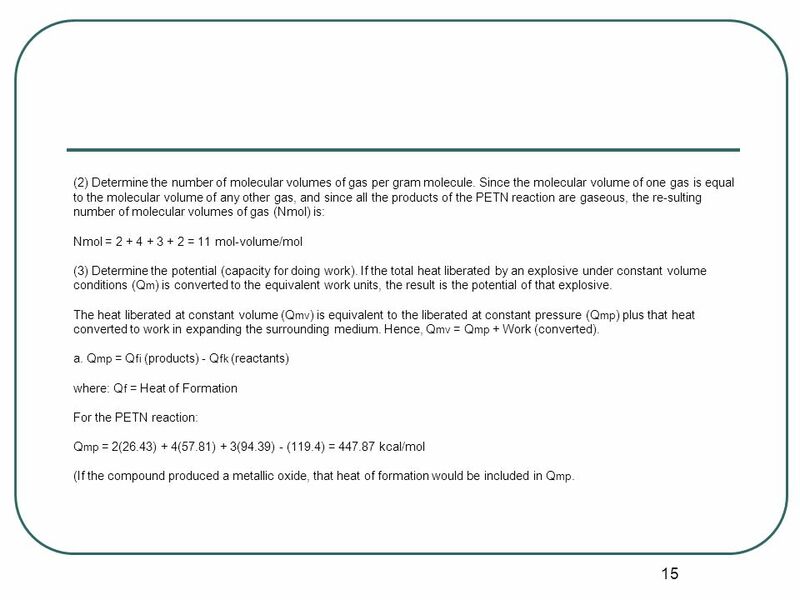 15 15 (2) Determine the number of molecular volumes of gas per gram molecule. 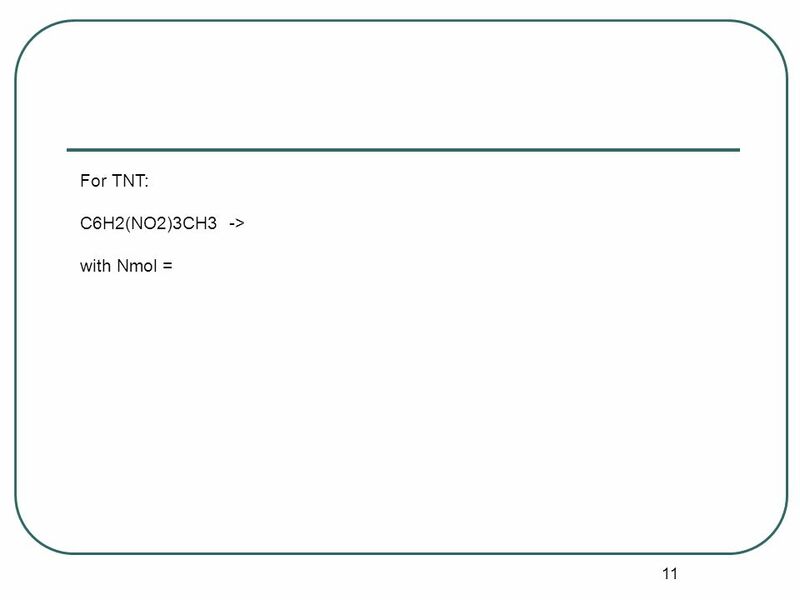 Since the molecular volume of one gas is equal to the molecular volume of any other gas, and since all the products of the PETN reaction are gaseous, the re-sulting number of molecular volumes of gas (Nmol) is: Nmol = 2 + 4 + 3 + 2 = 11 mol-volume/mol (3) Determine the potential (capacity for doing work). 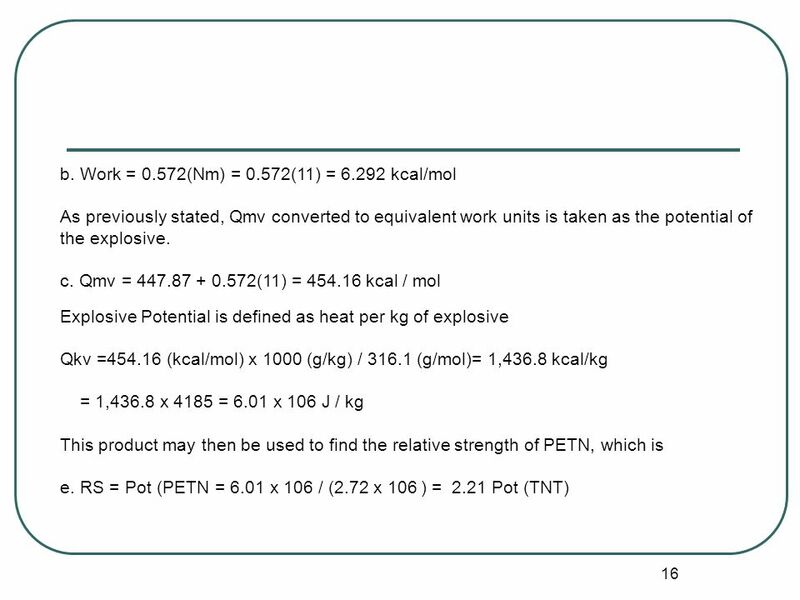 If the total heat liberated by an explosive under constant volume conditions (Q m ) is converted to the equivalent work units, the result is the potential of that explosive. 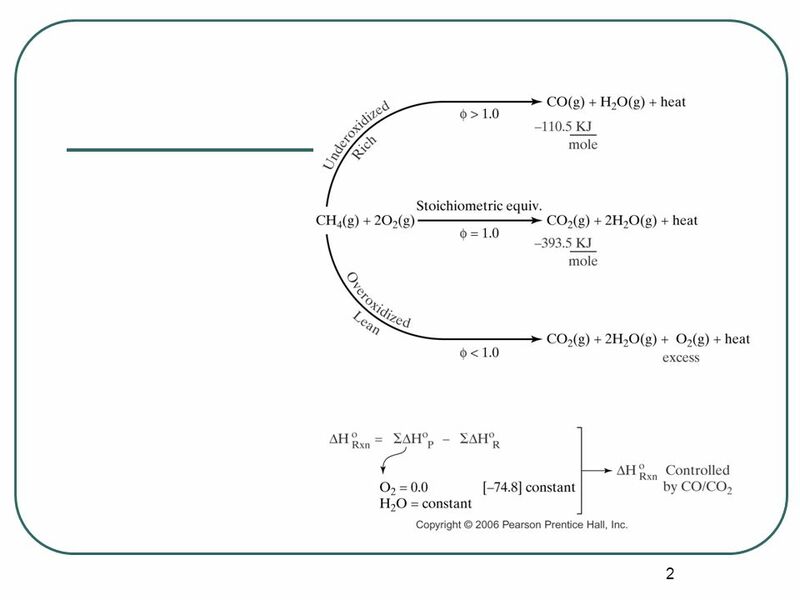 The heat liberated at constant volume (Q mv ) is equivalent to the liberated at constant pressure (Q mp ) plus that heat converted to work in expanding the surrounding medium. Hence, Q mv = Q mp + Work (converted). 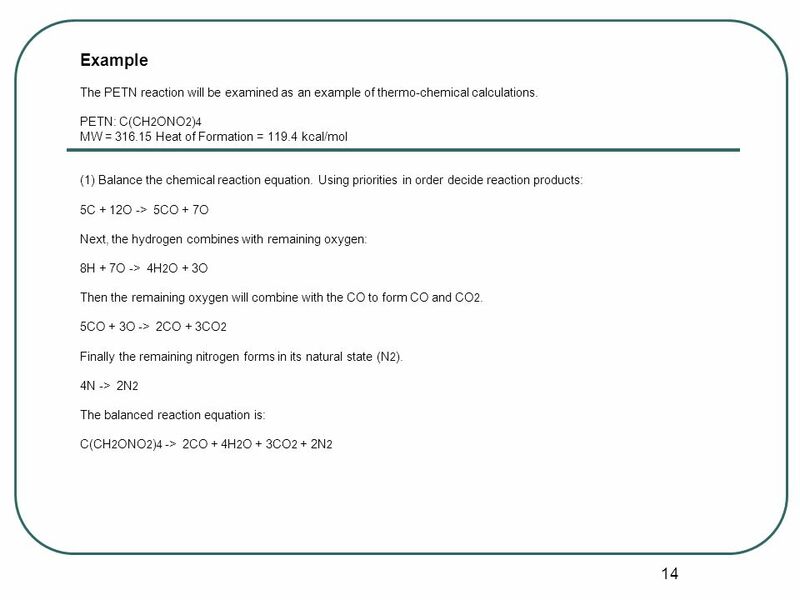 a. Q mp = Q fi (products) - Q fk (reactants) where: Q f = Heat of Formation For the PETN reaction: Q mp = 2(26.43) + 4(57.81) + 3(94.39) - (119.4) = 447.87 kcal/mol (If the compound produced a metallic oxide, that heat of formation would be included in Q mp. 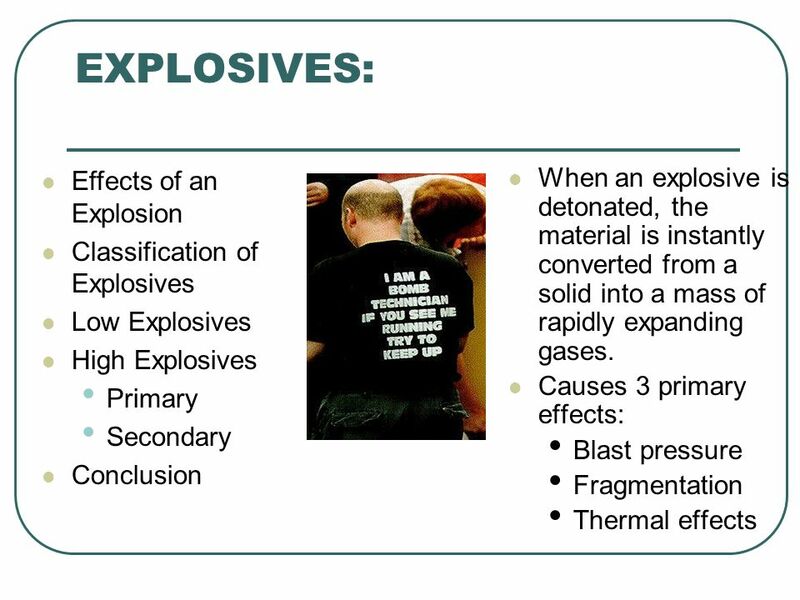 Download ppt "EXPLOSIVES: Taken in part from a seminar by Jim Kahoe and Greg Brown Effects of an Explosion Classification of Explosives Low Explosives High Explosives." CA Standards Std. 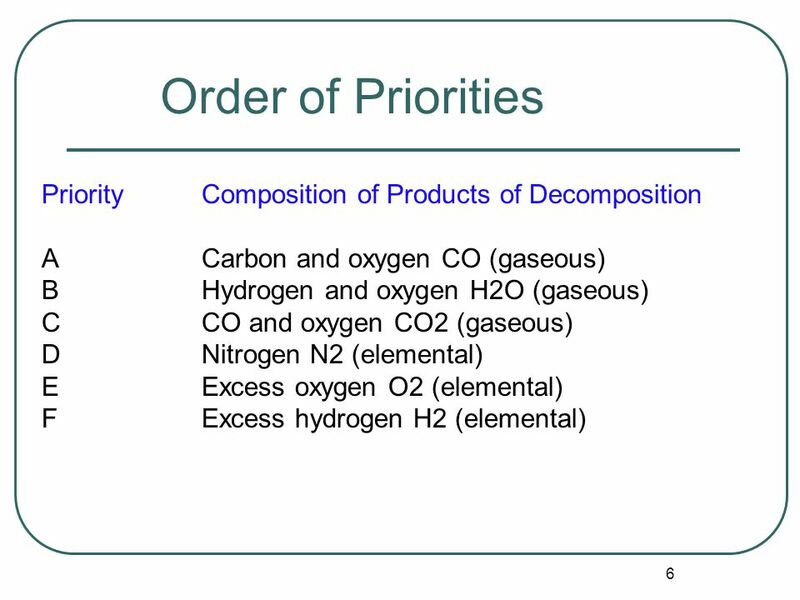 3e: Students know how to calculate the masses of reactants and products in a chemical reaction from the mass of one of the reactants. 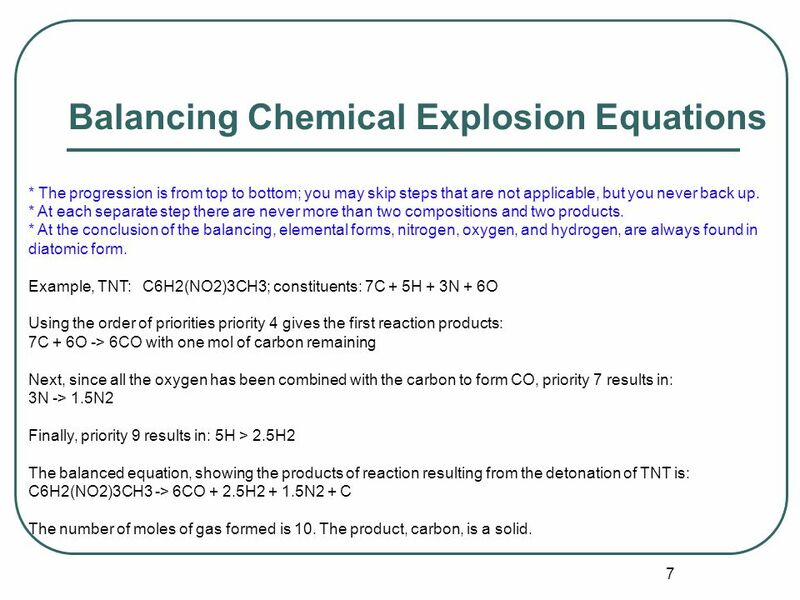 Stoichiometry: The study of quantitative measurements in chemical formulas and reactions Chemistry – Mrs. Cameron. 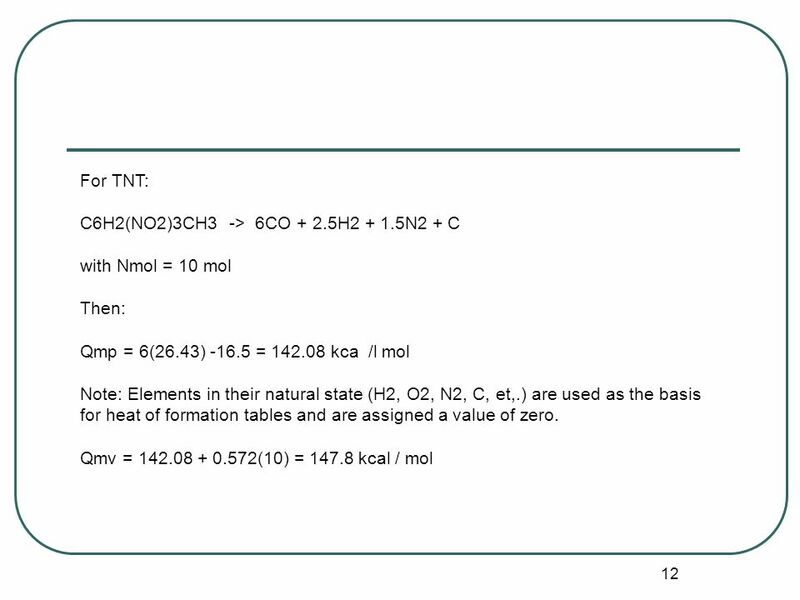 Unit 4 – The Mole Honors Chemistry Part 1.